Joseph Louis Lagrange was a French (originally Italian, Giuseppe Luigi Lagrangia) mathematician and astronomer who made important contributions to classical and celestial mechanics and to number theory. He was born in Turin, and moved to Paris, where he became a French citizen. He then became professor of mathematics in Turin at the age of 19 and later succeeded Leonhard Euler as head of the Berlin Academy of sciences. By his mid-twenties Lagrange was recognized as one of the greatest living mathematicians because of his papers on wave propagation and the maxima and minima of curves. 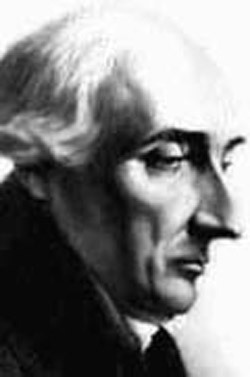 His prodigious output included his textbook Mécanique analytique (begun in 1753 but not finished until 1788), the basis for all later work in this field. He studied the three-body problem for the Earth, Sun, and Moon (1764) and the movement of Jupiter's satellites (1766), and in 1772 found the special-case solutions to this problem that are now known as Lagrangian points. His other remarkable discoveries include that of the Lagrangian, a differential operator characterizing a system's physical state. Under Napoleon, Lagrange was made both a senator and a count; he is buried in the Panthéon.